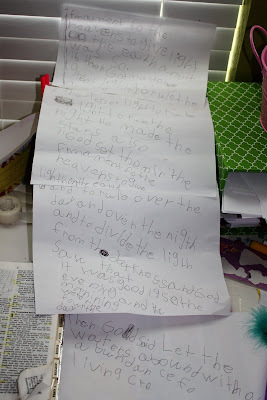 This is what I found on Rilyn’s desk today. 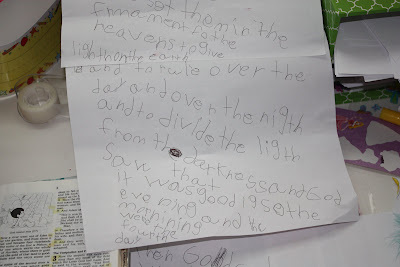 Wrapped up like a scroll, Rilyn had copied Bible verses from Genesis while I was resting with Ella. Rilyn has been drawn to His Word increasingly in the past few years. 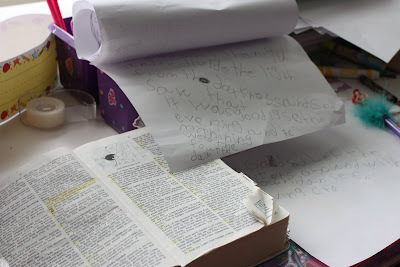 Her favorite ‘books’ to listen to are Bible stories; her favorite movies are Bible stories; in the morning, she wants to read the Proverbs instead of us reading to her; and her memory and knowledge of the Bible is amazing for someone of her age. God is drawing her near to Him and it is such a joy to witness her passion! Sweet to my soul also!